Belgium has begun detaining migrant children again, after a Serbian family with four young children became the first to be locked up in a new closed unit for migrant families near Brussels Airport - prompting condemnation from human rights groups. 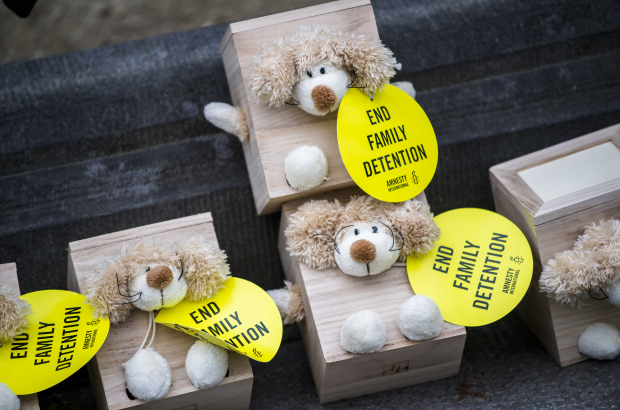 Amnesty International activists protested outside prime minister Charles Michel's office on Tuesday against the detention at the new "127 bis" centre in Steenokkerzeel, which has been built for families. "Belgium has been sentenced three times for the imprisonment of minors and today it is starting again," Amnesty director Philippe Hensmans said. "The impact for children of this kind of confinement is terrible. They find themselves literally in prison while their parents have committed only one fault: wanting a better life." The #NotInMyName collective, which is planning a protest in front of Manneken Pis on Wednesday, described the detention as "inhumane", adding: "We have just learned that a family was incarcerated. There is no reason to lock up these people - and especially not minors." The detained family are from Serbia and have four children aged 1-6, the Foreigners Office confirmed. They had lodged several requests for residency in Belgium on humanitarian grounds in 2011 and 2012, which were refused. The family were placed in an open facility pending deportation in 2017, but they fled. The Council of Europe's Commissioner for Human Rights wrote to Belgian migration secretary Theo Francken in June raising concerns about plans to detain migrant families in the new closed unit near Brussels Airport. The commissioner emphasised that children should never be detained on the grounds of their parents' immigration status, and invited the Belgian authorities to find suitable alternatives and not "revert to past detention practices, which jeopardise the protection of children’s rights". The parents are here illegally. They have evaded deportation and fled from an open facility. Separating the children from the parents is cruel and doesn't work as we've seen in the US. The most humane solution would be to ship these people back to Serbia without delay. What is the point of holding illegals in horrible detention centres when the ultimate aim is to return them to their home countries?